Born in Los Angeles California, Timothy Dueppen received his bachelors of music from UCLA, masters of music in performance and literature from The Eastman School of Music, and his doctorate in performance with a minor in music history from the University of Houston. Prior to his appointment at Montana State University, he was the adjunct professor of low brass at Nazareth College and the assistant director of the Eastman Trombone Choir from 2006-2008 while studying under legendary trombonist Dr. John Marcellus. He also was the director of the University of Houston Trombone choir from 2010-2011 and the Nazareth College trombone choir from 2006-2008. Timothy has toured with John Marcellus in New York and Pennsylvania, including performances at Carnegie Hall in New York City and the National Presbyterian Cathedral in Washington D.C. Additionally, he was a member of the international brass quintet “Metales M5” and toured extensively throughout Canada, Mexico, South America and the United States with the group. He has given master classes at numerous Colleges, Universities and secondary schools, including recent master classes at the International Festival of Music in Cartagena, Colombia. Timothy has been seen on international television for his performances in Colombia, Canada, and the United States, and is currently working on a recording of new music for trumpet and trombone with Bach trumpet artist Alan Klaus. He is an active freelance trombonist in the U.S. and has also performed with Jazz greats Horace Silver, John Clayton, Bill Watrous, Kenny Burrell, and Bill Evans, among others. In addition, Timothy has played with the Houston Symphony (as a member of Virtuosi of Houston), Disney Jazz Band, Opera Pasadena Festival Orchestra, Golden States Pops Orchestra, Lone Star Lyric Opera, Intermountain Opera Orchestra, Montana Ballet Orchestra, and others. He is currently serving as Principal Trombonist with the Bozeman Symphony Orchestra, and is active as an orchestral representative. He has made recordings for the Disney Corporation and recently recorded music for the 2011 Miss USA Pageant. In addition, he has studied and worked with Bill Booth, Jens Lindemann, Tommy Johnson, Allen Barnhill, Brian Kauk and Alain Trudel. 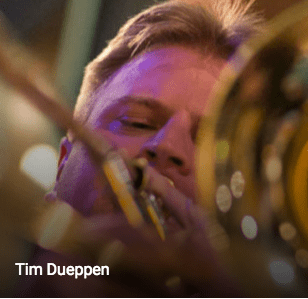 Additionally, Timothy has spoken at numerous conferences and festivals, including the 2013 Northwest Tuba and Euphonium Conference, and the 2013 Montana Music Educator’s Workshop Series. He is an active conductor, working recently as guest conductor/clinician for the 2013 Southwest Montana Honor Band in Ennis, and conducting numerous concerts this summer with the Bozeman City Band. As a researcher, Timothy is one of only a handful of trombone scholars in music history, and is currently working on turning his dissertation (“Wolfgang Amadeus Mozart’s use of the Trombone as Sacred Signifier in his operas”) into a book and series of articles, and is beginning a project that examines the trombone’s use by Joseph Krottendorfer in the symphonic medium 40 years prior to Beethoven. Timothy is happy to call Bozeman, MT home, and looks forward to continuing to build the brass studios and jazz programs.